The Dalai Lama earlier this year. WASHINGTON (CNN) - Meeting with top U.S. lawmakers a day after his 76th birthday, the Dalai Lama cited the principle of church-state separation in his recent decision to step down as the political head of an exiled movement. "The religious institution, the leader of the religious, and the political leadership, should be separate," he told the legislators during an appearance Thursday in the Capitol. "I myself combine! So my statement, my explanation, become like hypocrisy. Saying something, doing something different." "Religious institutions, political institutions, must be separate - the last several decades I emphasized that," he said. The bipartisan group of legislators temporarily put aside their politically charged negotiations over reducing the U.S. debt - some of which is owed to China - to show their admiration and affection for the man regarded by the Chinese government as the leader of a separatist movement. House Speaker John Boehner welcomed him by affirming that "our commitment to the Tibetan people has always brought the two parties together and I expect it will continue to do so no matter how long it takes." Boehner added: "We appreciate that the Dalai Lama is taking time to speak with us about how we can help spread our shared values not just in Tibet and China, but the Middle East as well." "When he was a very little boy and first became the Dalai Lama, President Franklin Delano Roosevelt sent him a watch recognizing his love, even as a little boy, of science and technology," the California Democrat said. "It's always a source of great pride to us that this relationship between our two countries and leaders goes back so far." Despite relinquishing his political role in Tibet, the Dalai Lama continues to personify a thorn in U.S.-China relations. President Barack Obama did not meet with him in 2009 amid controversy surrounding Obama's trip to China, but last year the two met in a closed press session at the White House, an event the Chinese Foreign Ministry said "grossly interfered in China's internal affairs, gravely hurt the Chinese people's national sentiments and seriously damaged the Sino-U.S. ties." The White House has remained silent on whether the two leaders will meet during his current 11-day visit to Washington. In 2007, then-President George W. Bush presented the Dalai Lama with the Congressional Gold Medal. The Dalai Lama has denied Beijing's accusations that he seeks to separate Tibet from China, claiming his goal is for a strong Tibetan autonomy under Chinese rule. At the end of May, he approved amendments to the exiled constitution formally removing his political and administrative responsibilities. China has recently closed Tibet to foreign visitors, pointedly not citing the upcoming third anniversary of the violent anti-government riots in 2008 that killed at least 22 people. Tibetan rights groups maintain that nearly 140 were killed in the wake of unrest across Tibetan areas of western China and the ensuing military crackdown by the Chinese military. 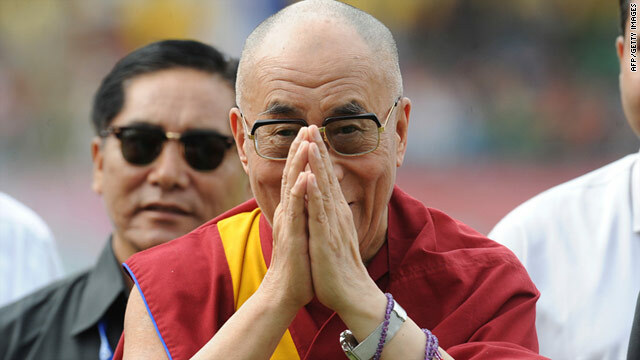 With the help of the CIA, Tenzin Gyatso - who is considered the 14th reincarnation of the Dalai Lama - went into exile at the outset of the 1959 Tibetan uprising, a decade after the ascension of China's Communist government, and set up a government-in-exile in Dharamsala, India. He has said that his successor will either be born in exile, or that he will be the last Dalai Lama. Tibet is Tibet. It is an independent country that was invaded by the Chinamen. Why should you settle for less ?? ?